Spirit Wing Aviation was formed by Calvin Burgess in 1988. 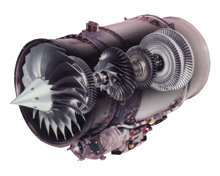 The company engages in two principal activities; (1) the ownership and operation of corporate aircraft used in the business transportation of Dominion officers and employees, and (2) the modification of 24 and 25 series Learjets with the new Williams-Rolls Royce FJ44-2C fanjet. Spirit Wing Aviation is seeking certification for single pilot operation of its SpiritJET™ modification to the 25 series of Learjets. Because of the substantial configuration changes made to install the new Williams FJ44-2C engines and the aerodynamic changes made to the aircraft, the control forces have been dramatically reduced which should allow for approval of the modified aircraft for single pilot operation.